We use and sell many blocks from leading vendors, including Dart, Brodix, and Donovan. We have everything from cast iron blocks to billet aluminum blocks. 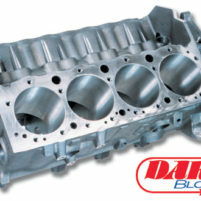 Also, we offer Super Series short block combinations that are matched and ready for assembly. 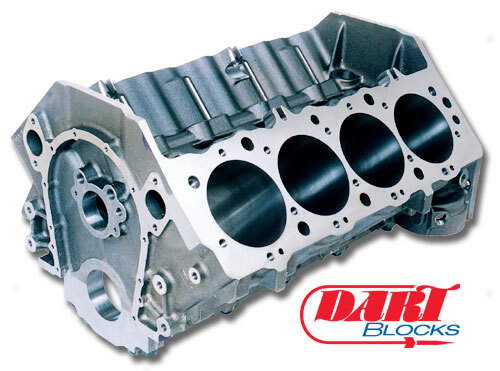 Many of our Super Series engines feature Dart Big “M” blocks. The cast-iron Big M big-block is a no compromise design that solves the problems that have plagued big-block racers for years. Working with top builders and Dart’s own championship-winning Pro Stock engine department, they have designed a user-friendly block with the features you need today. For example, Dart redesigned the lubrication system to create a true ”priority main” system that oils all of the main bearings before the lifters for extra reliability. The stepped main oil gallery (9/16” to 1/2” to 7/16”) increases the flow of oil to the crank at high RPM, and our front oil crossover eliminates internal oil leaks around the distributor shaft. The result: more oil at the bearings and pushrods where it’s needed, and less power-robbing crankcase windage. Big-blocks are prone to head gasket failure in long spans between head bolts. Dart has added two head stud bosses on both sides of the lifter valley to take the place of the ”missing” head bolts. The bosses are slotted so yo can use studs instead of hard-to-install bolts. Dart machines these blocks in-house on precision CNC equipment to ensure quality and to eliminate the need for expensive ”blueprinting”. They have engineered the Big M to be the strongest, most reliable, and easiest to build big-block on the market. Siamesed Extra-Thick Cylinder Walls: Resists cracking and improves ring seal (minimum .300” thick with 4.625” bore). Scalloped Outer Water Jacket Walls: Improves coolant flow around the cylinder barrels to equalize temperatures. Four-Bolt Main Bearing Caps: In steel or ductile iron have splayed outer bolts for extra strength. Crankshaft Tunnel: Has clearance for a 4.500” stroke crank with steel rods without grinding. True ”Priority Main” Oil System: Lubricates the main bearings before the lifters. Oil Filter Pad: Drilled and tapped for an external oil pump. Rear Four-Bolt Cap: Uses standard oil pump and two-piece seal – no adapter required! Lifter Valley Head Stud Bosses: Prevent blown head gaskets between head bolts. External Block Machining: Reduces weight without sacrificing strength. Simple Install On Any Chassis: Mechanical fuel pump boss, clutch linkage mounts, and side and front motor mounts simplfy installation on any chassis. Dual Oil Pan Bolt Patterns: Fits standard and notched oil pans. Bellhousing Flange and Rear Main Bearing: Reinforced with ribs to resist cracks. Note: Does not include cam bearings, freeze plugs, or dowels.